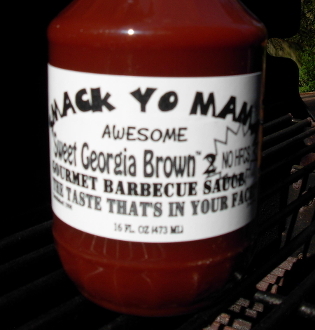 Our flagship sauce: smoky, dark brown sugar, ketchup with a tiny "bite" to make things interesting. Not a significant source of saturated fat, cholesterol, dietary fiber, vitamin A, vitamin C, calcium or iron. Ingredients: Tomato concentrate (sugar, vinegar, salt, natural flavors, potassium chloride, onion powder, citric acid, garlic powder, spices), Brown Sugar (sugar, molasses), Cider Vinegar, Apple Juice (apple juice, water, apple juice concentrate), Garlic Powder, Coffee, Onion, Pepper Sauce (vinegar, red pepper, salt), Worcestershire Sauce (Distilled White Vinegar, Molasses, Sugar, Onions, Anchovies, Salt, Garlic, Cloves, Tamarind Extract, Natural Flavorings, Chili Pepper Extract), Liquid Smoke (water, natural hickory smoke flavoring).